Confront the creatures that go bump in the night! Bestiary 4 presents hundreds of new monsters for use in the Pathfinder Roleplaying Game. Within this tome of terrors you'll find pitiless psychopomps and blood-drinking nosferatu, insectile formains and faceless nightgaunts, and even unique mythological horrors like Spring-Heeled Jack and Grendel himself. Yet not every creatures need be an enemy, as mighty empyreal lords, primeval outer dragons, and valorous swan maidens enlist you in their epic battles! 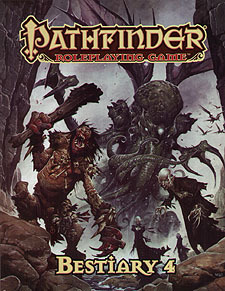 Pathfinder RPG Bestiary 4 is the fourth indispensable volume of monsters for use with the Pathfinder Roleplaying Game and serves as a companion to the Pathfinder RPG Core Rulebook and Pathfinder RPG Bestiary. This imaginative tabletop game builds upon more than 10 years of system development and an Open Playtest featuring more than 50,000 gamers to create a cutting-edge RPG experience that brings the all-time best-selling set of fantasy rules into the new millennium. Entities of mythic might, from despotic demon lords and alien elohim to terrifying Great Old Ones - including Cthulhu!